If Dan Zanes invites you for a boat ride, expect to be given an oar. The friend requests that Dan Zanes recently made became his latest release in the Dan Zanes and Friends series, Lead Belly, Baby! 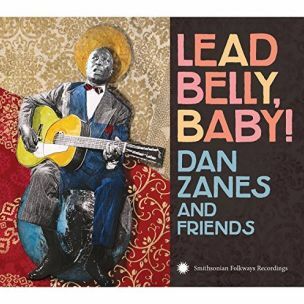 Musically, the songs of Lead Belly have been audio friends of Dan Zanes for many years. He first heard the music of The King of 12-String Guitar at a young age, immediately making himself part of the songs, explaining that ‘Lead Belly’s music made me play as a 7-year old, and I’ve been doing that ever since. Lead Belly was the reason I started making music, and Lead Belly was the template for everything I’ve done in family music. I consider him to the father of modern family music’. 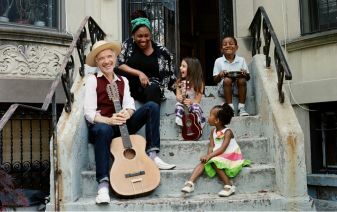 Dan Zanes and Friends continue the traditions in Lead Belly, Baby!, molding varied grooves and methods of delivery into one big circle of Roots music presented for family listening and participation. A constant cast of artists spins through the songs and styles like a musical kaleidoscope on Lead Belly, Baby! Psychedelia soundtracks the trip that gets Billy Bragg on board with Dan Zanes and Friends for “Rock Island, Line”. The studio family that makes the songs so inclusive features Madame Marie Jean Laurent and CeddyJay (“Bring Me Little Water Susie”), Aloe Blacc and Pauline Jean (“Boll Weevil”), and Marley Reedy (“Stewball”). A horn riff hops into the street parade rhythm of “Relax Your Mind” featuring Nena Jewrajka as “Cotton Fields” bilingually retells its tale with Friends Sonia De Los Santos, Elena Moon Park and Josef Joaquin Garcia. Lead Belly, Baby! 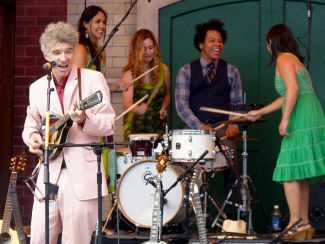 is a debut release for Dan Zanes and Friends on new label, Smithsonian Folkways. The signing completes another circle with the album released on a label that featured the original Lead Belly songs on his most famous recordings in the 1940’s while on the Folkways Records roster. Chuck D (Public Enemy, solo) and Memphis Jelks run words for “Skip to My Lou” as Valerie June helps Dan Zanes and Friends “Take This Hammer” on a marching pace through Lead Belly, Baby!